Take your phone swimming, running and more with these fitness focused handsets. Getting fit has got a lot easier with the rise of smartphones and their various fitness tracking tools and apps - but which shiny new smartphone should you plump for if you're thinking of shedding the weight? If you're serious about getting fit and want a smartphone to help you then don't just go out and buy the first shiny handset you see, because some are a lot more suited to that all important task of personal betterment than others. We've got you covered with the best of them, handily split into five different categories. If you want to go biking through the forest with your phone in tow then it's worth ensuring it's dust proof, otherwise it might not work quite so well by the time you get home. Likewise if you want to take your phone out for a jog in the rain you'd better make sure it's water resistant. 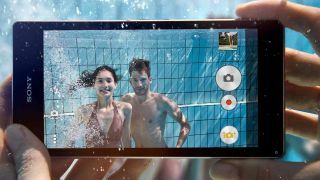 The Sony Xperia Z1 ticks both of those boxes, as it's IP58 certified as dust proof and water resistant for up to 30 minutes at depths of up to 1.5 metres (in freshwater), so if you're feeling really brave you can even take it swimming. Not only that, but it's also a top flight phone in other ways, with a 2.2 GHz quad-core processor, 2GB of RAM and a 5 inch 1080p display. The Samsung Galaxy S4 Active isn't quite the phone the Sony Xperia Z1 is. It's not as attractive, thanks to being shorn of the smooth lines, and has a less impressive camera. But with a 1.9 GHz quad-core processor, 2GB of RAM and a 5 inch screen it's almost as good in most other ways. Crucially it's also IP67 certified dust and water resistant, which means you can submerge it in fresh water up to 1 metre deep for up to 30 minutes. The Samsung Galaxy S4 does so many things right. From its powerful 1.9 GHz quad-core processor and 2GB of RAM, to its impressive 1080p 5 inch screen it's a flagship phone through and through. But thanks to a handy built in app called 'S Health' it's also a surprisingly useful tool for fitness fanatics. S Health is a fairly comprehensive fitness tracker, which lets you log your workouts, your weight, your blood pressure and what food and drink you've consumed. As well as manually entering activities and foods it can also automatically keep track of how many steps you take throughout the day (using the built-in sensors) and can be used to set and track long term goals. There are even a range of compatible accessories available to help you get more out of the app, covering everything from a fitness tracking wristband to scales and blood pressure monitors. One of the more unexpected things about the iPhone 5S was that it includes an M7 motion coprocessor, the sole purpose of which is to track any motion picked up by the iPhone's accelerometer, gyroscope and compass. Some other phones use their main processor to do this, which means having the CPU active even when the phone is idle and uses a lot of battery as a result. The M7 on the other hand uses very little battery as it has a clock speed of just 150 MHz. So in combination with fitness tracking apps it can keep track of your movement all day everyday with minimal impact on your phones battery, and can port the data to a number of apps. If you're keeping active then you really don't want your phone weighing you down. So having a light handset, not to mention one that's small and very portable is desirable. In general smartphones seem to be getting bigger all the time, with the likes of the Sony Xperia Z Ultra approaching tablet territory with a 6.4 inch screen.